How do IT teams go from managing internal operations to delivering immersive digital experiences? It’s time to embrace a new paradigm, IT Operations as a Service, that calls for enterprise IT to transform into service providers, by offering common operations management functions as a shared service across different lines of business. Stop managing infrastructure and start delivering end-to-end digital services. Gain the right operational insights across different IT services, platforms, and point tools in your enterprise. Manage all the proactive and reactive issues that affect your business services and operations. 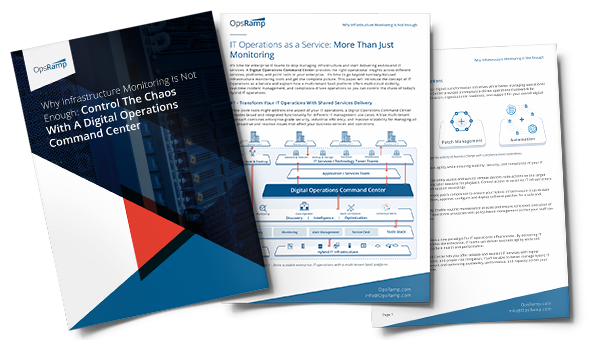 Download the ‘Why Infrastructure Monitoring Is Not Enough: Control The Chaos With A Digital Operations Command Center’ white paper to understand how you can keep pace with the rate of change using a command center that’s built for a broad range of operational use cases.